TIP: Add more spices if you are using plain gf bread crumbs or if you want it a bit spicier. Optional: 1 or more whole almonds and, of course, 1 or more presents! The gifts are fun – especially if there are children present – but the dessert really stands on its own. Melt butter in frying pan over medium heat. Add crumbs, sugar, and spices and heat until blended and slightly toasted. Remove from heat and spread on cookie sheet or plate to cool. In a parfait bowl, alternate layers of crumbs and applesauce. Refrigerate overnight. Just before serving, “poke” the almond(s) into the dessert and cover with plenty of whipped cream. You can garnish with chopped maraschino cherries. 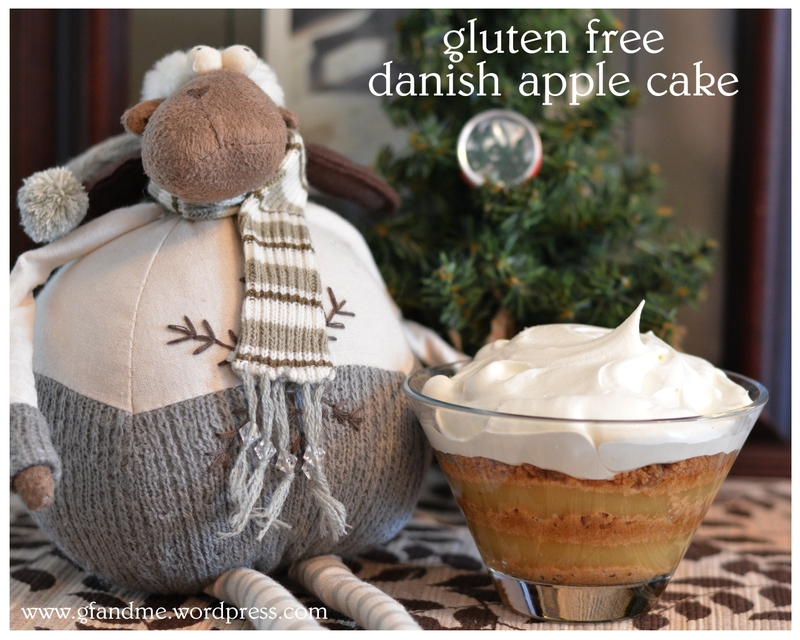 This entry was posted in Baking, Drinks & Desserts, Recipes and tagged apple, Cake, Christmas, danish, GF, gluten free. Bookmark the permalink. That looks delectably gorgeous. I also love the model in the photo. 😉 Gray is such an elegant color. Thanks so much. He didn’t charge much for a fee either! How fun. 🙂 Thanks for sharing the recipe and the family story. Wish I had more than I do. Most seem to involve the holidays. I do have an awesome Danish birthday cake, but I haven’t tried making it gf yet. Hope to soon. Wow! This sounds easy enough & perfectly indulging! 🙂 Thanks for sharing. You’re very welcome. It’s really, really good. Wish I had some now.